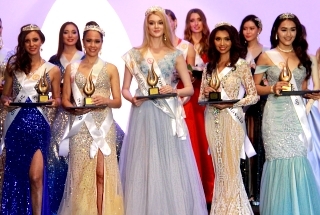 PHILIPPINES wins its FIFTH in the Golden Miss Asia Pacific International last October 4,2018. 2018 will be the year of the Philippines in the world of beauty pageants. Last edited by DUBROVNIK on Thu Oct 04, 2018 6:48 pm, edited 1 time in total. The bashers are now consolidating forces. They have to say someting bad about the winner. Othewise, they will have a heart attack. CONGRATS PHILIPPINES. IS THAT CORY QUIRINO IN THE PIC ABOVE? My favorite to win the 50th Miss Asia Pacific International is any of the following: Australia, Belgium, Netherlands or New Zealand but none of them did but I am not surprised and actually I knew a bit from the start that Philippines will win for two reasons I think: the 50th Golden Anniversary will be a fitting tribute if the organization founding country and nationality will be its winner to cap its half of a century of competition and second, coincidentally another history in the making fact is that Sharifa is a Muslim woman from southern Philippines and it would be an interesting story if a Muslim woman can win a small international pageant. That would be an interesting history in the making news to tell the world and the noise it makes can be beneficial to the organization I think the org can capitalize on that barrier breaking event to capture the attention of pageant fans around the world. Message: i want to make friends and learn from fellow pageant fanatics. tbh, this girl is the least that I would expect to win. I saw her judging a gay contest in a noontime show and I had a hard time trying to ponder on her views. She even had a hardtime expressing her thoughts in English. In Filipino term, trying hard. Last year's rep is better. Anyway she won, was chosen by the judges so still a huge congratulations to the Philippines. Last edited by uzumaki on Thu Oct 04, 2018 5:31 pm, edited 1 time in total. I only saw a pageant clip of the top 10 announcement and i must say she was a standout regardless of her sash. Minor crown, but still... Congratulations! manoypoe wrote: CONGRATS PHILIPPINES. IS THAT CORY QUIRINO IN THE PIC ABOVE? She was also a judge in last year’s finals. 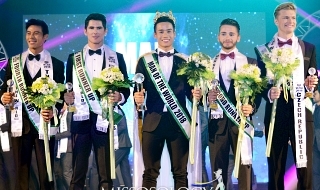 I checked the youtube clips of the finals and I am wondering why Miss Earth can’t hire the same interpreters they hired in Miss Asia Pacific. They were all good, same level as the interpreters of Miss Universe. To be honest, Brazil should've won. If Karen Gallman will win Miss Intercontinental in the philippine soil it would be okay coz Karen is beautiful. But it is what it is, its a minor pageant, congrats Philippines though. Message: Different strokes for different folks. Message: No ones is more hatedness than is them who was speakings the truthfullness. Of course you will always interpret any crowns that the Philippines won as a cooking show. How old school! Can't you think of a new way to bash? Geez!!! FYI. The last time Philippines won Miss Asia Pacific was 1993 (with Michelle Aldana). 25 years, dahlin! 25 freaking years! Why so much hatred towards your fellow Filipino? A huge crab mentality! Anyways, you can bash Philippines to death, but the fact is Filipinas came prepared and fight relentlessly. In every contest they joined. And they are on top! Be it in major and minor pageants. That's a fact! I don’t think it was rigged. But what I don’t get is that the judges were not able to see through the fact that her answer was memorized. She had a generic answer that went along the lines of “diversity”, which was the theme of the pageant, a memorized piece that will tangentially answer any questions on diversity. Ganyan dapat mag patong ng crown ang isang TRUE beauty queen. Hindi yung ipatong lang ng isang kamay. You mean the gowns during their crowning??? No. Check youtube, there was a Q&A and EG competition. They only wore the gold gowns for their final look. I just noticed the way she answered the Q&A it reminds me of Eva Patalinjug. is she from KF? JaninaCruz-Vega wrote: Congrats to her! I THINK SHE IS WITH KF, ROGIL FLORES WAS THERE, HUGGING HER AND TAKING PHOTOS WITH HER AND OTHER WINNERS. Message: Sometimes you just have to play the role of a fool to fool the fool who thinks they are fooling you. 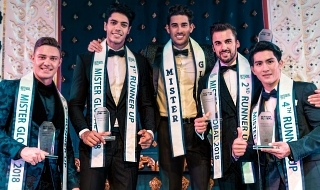 This pageant is way more prestigious and reputable than the hideous Miss Grand International owned by Nawat Itsaragrisil of the Kingdom of Thailand (headquartered in Krung Thep Maha Nakhon or Bangkok).